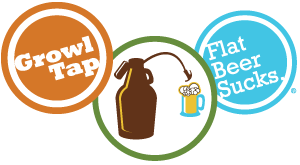 The GrowlTap is a patent-pending design that ensures the beer in your growler remains fresh and carbonated. Don’t know what a growler is? Growlers are used to transport beer home from craft breweries. They are reusable and are more ecologically friendly than bottles or cans, even if you recycle. Check out our Kickstarter video.